Being a quality centric firm, we are presenting a quality tested array of Multi Pink Slate Stone. 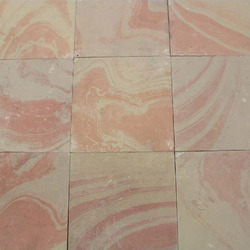 The Multi Pink Slate Stone we offer is widely demanded amongst the clients for its beautiful colors. Known for their stain free and easy to clean nature, these products are highly demanded all over the world. We are offering a wide range of Pure Pink Slate Stones. These are very beautiful and always add a touch of elegance to the interiors and exteriors. Effective features are: strength, durability, weather and corrosion resistance, affordable rates and long life. lime Pink slate stone adds a graceful touch to living and working area. Lime Pink stone is very tough and resistant to slip and is highly resistive in freezing and thawing conditions thus making it ideal for commercial sites. Lime pink slate is infusion of pink and white shades it is a sedimentary stone and mainly consists of calcite. It has a smooth granular surface, does not show much graining or crystalline structure and varies in hardness. Having natural cleft finish & subtle & soothing shades, this lime pink limestone delivers indoors & outdoors, strength & enchanting look.